Atopic Dermatitis | Nelson Lee Novick, M.D. Atopic dermatitis (AD) is a disease that causes itchy, inflamed skin. 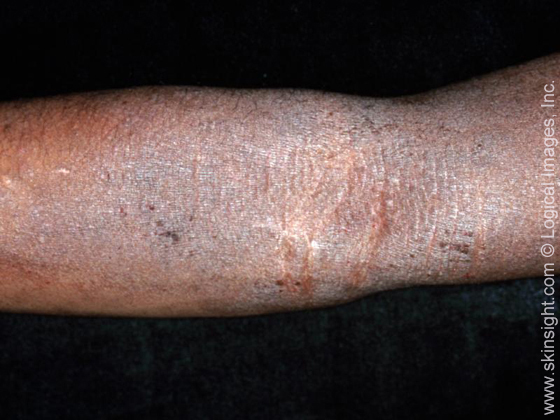 A substantial proportion of the US population has symptoms of eczema or eczematous conditions; 31.6 million people have symptoms of eczema, and 17.8 million for atopic dermatitis, considered a more severe form of eczema. It typically affects the insides of the elbows, backs of the knees, and the face, but can cover most of the body. AD falls into a category of diseases called atopic, a term originally used to describe the allergic conditions asthma and hay fever. AD is not contagious. Research indicates that atopic diseases like AD are genetically determined, inherited from one’s parents. A child with one parent who has an atopic condition has a one in four chance of having some form of atopic disease. If both parents are atopic, the child has a greater than one in two chance of being atopic. 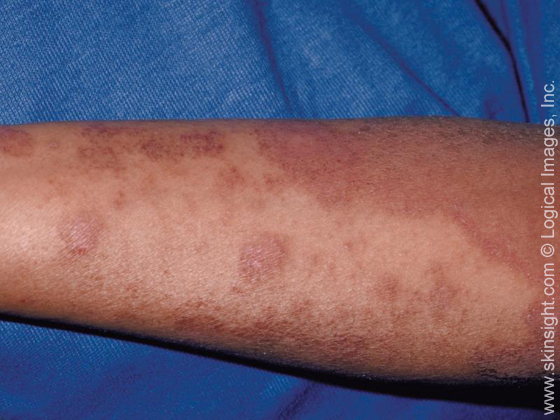 This image displays extensive atopic dermatitis (eczema); note the skin is dry and scaly, which is typical of atopic dermatitis. This image displays atopic dermatitis (eczema) in the body folds of the back of the legs coupled with staph bacteria. Atopic dermatitis (eczema) typically involves the folds of the elbows and knees. When longstanding, the skin can be very thickened (lichenified) from chronic scratching. © 2016 National Eczema Association. All Rights Reserved.